Veteran BJP leader LK Advani's Jan Chetna Yatra against corruption gave a miss to the memorial of martyrs Bhagat Singh, Rajguru and Sukhdev at the Jagraon Bridge here today. The yatra entered the city at 7pm and was scheduled to the stop at the martyrs’ statue at Jagraon Bridge. But, the veteran politician who hopes to someday become prime minister preferred to skip the memorial and proceed to the Daresi ground to address the rally since he was running behind schedule. The atmosphere was electric with local BJP workers jumping with joy and dancing on the roads. Many joined Advani’s cavalcade and burst crackers. The rath followed by a cavalcade of vehicles led to a massive traffic jam in the Daresi area. The tall claims of foolproof traffic arrangement by the police went up in smoke with overzealous BJP supports breaking the security cordon which further led to a major traffic jam. The city traffic went for a toss after the police imposed major traffic regulations for the veteran BJP leader, LK Advani's Jan Chetna Yatra earlier on Sunday. The cordoning off of all the major routes left the city residents high and dry earlier during the day. The entire Ferozepore road was out of bounds much before the arrival of the yatra. Daresi ground, the venue of the yatra was specially decked up for the occasion. Due to the high security, the residents were not allowed to enter the old city. The yatra adversely hit the business, complained the shopkeepers of the Chaura Bazar. “The traffic police imposed regulation since early morning and did not allow any vehicle to enter city. The resident were not allowed to take their vehicles in Chaura Bazar, Clock Tower and Daresi area due to which we suffered huge loss,” said Tarsem Singh, shopkeepers at Chaura Bazar. “Today I felt that we are living in an organized prison. We were not allowed to move in the Chaura Bazar due to yatra. 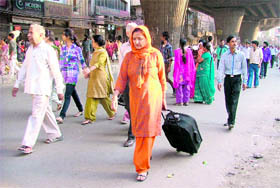 Sunday is the only day for shopping and that too has been spoiled by the yatra,” said Reenu Rani, of Haibowal. Due to the imposition of traffic regulation the auto rickshaws were not allowed to take the vehicle inside the old city area. Many residents were seen walking towards their destination in the absence of any vehicle. Advani and his daughter have been was booked in room suite 729 on the seventh floor of Hotel Fortune Klassik. As a result, the entire floor has been vacated. Guests, who were booked into other rooms on the seventh floor, have been shifted to the hotel’s eighth floor. SAD (Delhi) workers led by Gurdeep Singh Gosha protested against LK Advani’s yatra and termed it (the yatra) as a cheap political stunt in the wake of the forthcoming elections. “They are least bothered about corruption. The motive of the yatra is to get politicial mileage. Their party is in deep trouble in Punjab and it does not seem likely that they would win any seat in the assembly election,” said Gosha. LK Advani’s visit led to chaos on stage with local BJP leaders engaging in a struggle to find space. A few entered into heated arguments. The matter was resolved following intervention by senior leaders. 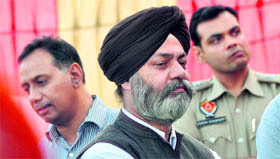 While Ishmeet’s mother and sister conspiciously stayed away from the inauguration function, Ishmeet’s father, Gurpinder Singh, remained aloof throughout the function. Talking to the Tribune, he said he had “no interest in the inauguration function, the government and the institute”. Gurpinder Singh was seen standing quietly away from the stage. He said he was keeping away from political limelight and other activities. Talking about the distance he maintained, Gurpinder Singh said, "I am here just for formality. My wishes are always with the institute. Being a proud father is enough for me instead of being a manager of any institute. It is our family’s decision to stay away from this institute." "We lost our son. It was the worst tragedy that could hit anybody. So, things are different for us. We feel more at peace being in the privacy of home instead of exhibiting our feeling to the entire world. Ishmeet still lives in the heart of people. He does not need any politicians to keep alive his memory,” he added. As his father kept away, Dr Charan Kamal Singh, uncle of Ishmeet Singh and a veterinarian was trying to steal the show by participating actively in the function. He gave the inauguration speech and welcomed the Cheif Minister. Even the clipping which was screened in the presence of chief minister was highlighting Dr Charan Kamal Singh. "I am more committed to Ishmeet, this project and its progress and possibility of spotting new talent. I would request and hope from everybody including my elder brother (Ishmeet’s father) that he should bless us," said Dr Charan. Ishmeet Singh Music Institute has been constructed in his memory by GLADA on 2.15 acres at a cost of ~11 crore. The institute has state-of-the-art facilities that includes an auditorium with facility for videography. In addition, a recording studio, a library, an audio-software training room and separate cabins for practice have also been set up. While inagurating the institute, Badal turned nostalgic and missed his wife. He recalled how his wife, Surinder Kaur, was a fan of Ishmeet and had even made calls to different relatives and aquaintances urging them to vote for him while he was contesting the ‘Voice of India’ reality show. “She was very happy when Ishmeet won the contest,” Badal recalled. "Ishmeet was honoured following his victory in the reality show when my birthday was celebrated in Bathinda. He sang a song on my birthday," recalled Badal. 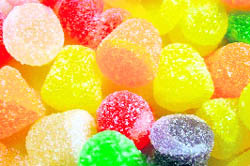 Eating sugar-free sweets? Hold on! The next time any sugar-free ice-cream, sweets or chocolate comes your way, resist the temptation as the joy your taste buds get can wreak havoc with your health. he reason is that the addition of artificial sweeteners in these may be cancerous. Taking serious note of the delay in providing information by the Ludhiana Improvement Trust (LIT), the state Information Commissioner has imposed a penalty of Rs 25,000 on the executive officer (EO) and the then public information officer (PIO) of the trust, ZR Khan. The commission has also awarded Rs 2,000 as compensation to the complainant, Rohit Sabharwal. In partial disposal of the complaint, state Information Commissioner Kulbir Singh said in his order, issued on November 11, that the amount of penalty, which was the maximum that could be provided under the Act, would be the personal liability of the EO and would be deducted from his salary. The compensation awarded to the complainant would have to be paid from the funds of the LIT before the next date of hearing. The complainant said in his petition that he sought information from the LIT on building bylaw violations in different LIT schemes from 2000 and follow-up action taken, if any, through an application filed on May 16. The commission noted that not only had the LIT authorities had failed in providing information to the complainant, but an LIT peon, Harpal Singh, had attended and marked his presence as clerk at the previous two hearings. It added that Harpal had been representing the LIT in five cases and had marked his presence at 33 hearings as clerk in all. “The commission has taken a very serious view of this action of the PIO by sending a peon to attend the hearings in the commission. This shows that the PIO is not taking the RTI Act seriously and has scant regard for the mechanism created under the RTI Act,” the Information Commissioner observed in the order. Before parting with the order, he directed the LIT authorities to provide complete information to the complainant before the next date of hearing. The case would come up for proceedings on December 16. Thieves struck at a house in New Shakti Nagar near Jodhewal Basti and decamped with cash and jewellery worth over Rs 10 lakh. According to the police, the house belongs to Laxman Singh, an NRI. While Laxman Singh is settled in West Asia, his wife Rani and children are living in the house. Rani told the police that she had gone to attend the wedding of one of her relatives in Jalandhar on November 10. The incident came to light last evening when Rani and her children returned from Jalandhar and found the entire house ransacked. A complaint in this regard was lodged with the police. A police team along with fingerprint experts visited the spot. The investigating officer said the theft seems to be the handiwork of an insider, who was aware of family’s absence. The thieves entered the house by scaling the wall. They broke open the main door and committed the theft with ease. They picked expensive cloths, jewellery and electronic appliances. The police has registered a theft case against unidentified persons. In a blatant violation of traffic rules and guidelines of the state transport department, buses owned by private operators continue to ferry passengers on roofs. Though there is a strict ban on ferrying passengers on the roofs, private bus operators continue to violate rules with impunity. Despite the fact that many people have lost their lives while travelling on the roofs of buses, the practice is going unchecked here. One can see overloaded buses, especially during rush hours, with passengers hanging on to the doors. Most of the buses cater to the village population where other modes of transport are not available thus forcing the people to risk their lives. Bus operators claim that they do not force passengers to climb atop the roofs. “We do not force them. They risk their lives as there is no other mode of transport in these villages,” said a conductor of a private bus. Passengers on the other hand say they do not want to risk their lives by climbing atop the roofs of buses, but in order to reach their respective destinations on time, they have to do so. A large number of people who come to the city from surrounding villages everyday for their jobs rush to board buses in the evening and when they don’t get seats they climb atop the roofs. Some villagers, who often travel on bus roofs, lamented that they were forced to do so as there were a few modes of transport available. “We have to travel like this almost everyday as we have no other option. It takes just 15 to 20 minutes for us to reach our destinations and it does not really matter how we reach there,” said Inderpal Singh, a daily wager, who comes from Manuke village to Jagraon everyday for work. The villagers have demanded that more buses be plied on these routes, especially during rush hours. The newly fixed cemented cover of the sewerage manhole on the College road here, which was re-installed by the civic body last week after the previous one had caved in a few days ago, has also started giving way. A portion of the manhole cover has already caved in. On October 31, the cover of the manhole, which is situated in the middle of the College road, had caved in when a loaded tractor-trailer went over it. Despite repeated complaints of the area residents, the manhole remained uncovered for four days even as a large number of commuters use the road for reaching their respective destinations. A car also got stuck in the open manhole on October 31, but the authorities did not take the matter seriously. The new cemented cover was installed on November 4 after the issue was highlighted in these columns. But the new cemented cover, too, started caving in within a week of its installation. Residents said in the past three months, five manhole covers had caved in. Cemented covers were fixed on all 13 manholes on the College road during the laying of inter-locking tiles here more than two months ago. concerned while fixing inter-locking tiles. The inter-locking tiles too have started dislocating due to the use of substandard material. aware of the issue. He refuted all allegations and claimed that substandard material was not used by the contractor. He assured the residents of doing the needful. Hosiery manufacturers and retailers are worried over the slow sale of woollens. A major reason is that the region is still not in the grip of winter. Manufacturers maintain that retailers in other states have been demanding woollens, but demand and sales have not picked up north of Delhi. Sudershan Jain of Sarjeevan Knitwears says retailers and manufacturers are worried, but it is too early to say anything. He has claimed that retailers in Delhi are worried as woollens from Bangladesh are being supplied at competitive rates. Another reason for the poor sales is the exhorbitant rates of sweaters, jackets and other woollens this season. Manufacturers maintain that prices of yarn have increased. Another manufacturer, Atul Kumar, has said a sweater available for less than Rs 1,000 past year is priced at Rs 1,400 or more at retail shops this time round. Seeing the increase in prices, buyers are reluctant in making bulk purchases, he says. A salesman at a retail showroom says there are just a few buyers this time round. “The season was excellent past year. It has been dull so far. Buyers purchase woollens for children, but not for themselves. Maybe they are waiting for colder days,” he adds. The government has introduced the Right to Education Act and it should be implemented everywhere. This was stated by RJ Khanderao, Regional Officer of the Central Board of Secondary Education, Panchkula. He was in the city to attend the annual day function of Sacred Heart Convent School, Sarabha Nagar. A few days ago Education Minister Sewa Singh Sekhwan said the state government had written a letter to the Centre asking it to exempt Punjab from implementing the Act till 2013, as the infrastructure needed to be upgraded in schools. With the cross-curriculum approach, extra burden of Comprehensive Continuous Evaluation can be reduced. For instance, a school can follow one theme per term and on the basis of that theme various activities can be conducted which can be incorporated through various subjects. For example, on the subject of pollution, a graph can be prepared which covers mathematics in some way. A debate can also be held on the subject. Competing in the age of technology will be very difficult if new entrepreneurs do not focus on 12 vectors of the innovation radar that include offering, platform, solutions, customers, customer experience, value capture, processes, organisation, supply chain, presence, networking and branding. These views were expressed by Dr SK Chadha, a senior professor in University Business School, Panjab University, Chandigarh. He was the resource person on the concluding day of workshop on “Entrepreneurship, Creativity and Innovations” at SCD Government College, Ludhiana. While differentiating between creativity, invention and innovations, he expresses his views on various dimensions of creativity. In the last session, Dr Sandeep Vij, Deputy Dean, Lovely Professional University, spoke on the emerging dimensions of entrepreneurship in India. He played various educational games with students. Dr Ashwani Bhalla, programme coordinator of MCom business innovations, motivated students to become job creators instead of job seekers. Dr Harblas of the department of commerce expressed his views on various deficiencies in education system. With the prices of laptops and computers witnessing a downward trend, owners of cyber cafes have shut down shop. It is hard to find a single café on the Mall road, Bharat Nagar Chowk, bus stand and Shastri Nagar. Meanwhile, cyber café owners have increased the surfing charges as the number of customers has decreased. A few café owners charge anything from Rs 60 to Rs 80 for one hour. There was a time when one could see a number of cyber cafes in the city. Despite the high cost of getting Internet service from the ISPs (Internet Service Provider), cafe owners made a healthy profit. Orkut, Yahoo and Facebook lovers helped the business boom. With the increasing popularity of Internet connections, the rush at the cyber cafés has cut down to some extent. With mobile browsing on smart phones becoming a hot favourite with youngsters, cafe owners suffered losses. Ludhiana, November 13‘Yuva Tarang’, a choreographic presentation, was organised at Guru Nanak auditorium here by the Nehru Sidhant Kender past evening. Sangita Bedar Kushwaha from Sangita’s School of Performing Arts, Pinky Chaudhary from Nrutya Bharti School of Dance, Gautam Sharma from Ecstasy The Dance Studio, Mika from Stepz Institute of Performing Arts and Purva Puri from Shobhaniya Kala Kendra gave dance performances with the help of students to showcase artistic talent. There were almost 250 participants. Students from Amit Verma’s Footloose Dance Studio also performed. The show was a potpourri of dance styles, including kathak, Bharatnatyam, salsa, belly dance and hip-hop. Chief Minister Parkash Singh Badal today asked members of his party, MLAs, former MLAs of Ludhiana, Jalandhar, Hoshiarpur and Nawashahar and SGPC members to arrange buses in sufficient numbers so that a large number of people could witness the inauguration of Shri Anandpur Sahib Heritage Complex on November 25. Addressing his party workers at the Government College for Women Badal said today that all four districts must arrange 25 buses (each constituency) to ferry people to Golden Temple on November 25. He said though the government would provide the buses, the diesel must be provided by the party workers. He said each constituency would have to bear the expense of Rs 2.5 lakh on diesel and the money must be deposited on time with the district president of the party. Apart from this, the Chief Minister asked his party workers to arrange private vehicles like Sumo, two-wheelers and even bicycles to reach the venue. He said, “Let it not be the event associated with Sikhs alone. Hindus, Muslims, Christians are welcome to witness this heritage complex on which state government had spent more than Rs 300 crore. A leading architect from the USA designed the complex. All are welcome to make the historical event successful on November 25. I have also invited Congress leaders to witness this great event,” said Badal. The Chief Minister said Chappar Chiri memorial would be inaugurated on November 30. The memorial was built in the memory of Baba Banda Bahadur on 20 acre. Hira Singh Gabria, Satpal Gosain, Harish Rai Dhanda, Mohinder Kaur Josh, Sarwan Singh Phillaur, Maheshinder Singh Grewal, Sohan Singh Dhandal, Desh Raj Dhugga, Avinash Chander, Bhag Singh Malha, Charanjit Singh Atwal, Amarjit Singh Bhatia, Darshan Singh Shivalik, Kuldeep Singh Wadala, Charanjit Singh Channi and Ajit Singh Kuhar were among those who attended the meeting. Sacred Heart Convent School, Sarabha Nagar, organised its annual function “Sylvan Soiree 2011” here today. It was based on the theme “Save the earth and support the UN declaration 2011, conserve the forests”. The students, representing delegates of 197 UN member-countries, took a pledge to support and work for sustainable growth of resources for coming generations. The students also apprised the gathering of the hazards modern technology posed to flora and fauna. From the disaster mobile phones had created to ‘techno-monsters’, they depicted how the environment was being affected by human carelessness. About 2,400 students of the school participated in various events. The function concluded with the National Anthem. Ludhiana: The department of chemistry at Khalsa College for Women organised an intra-college exhibition to mark “International Year of Chemistry 2011” under the “Chemistry our life, our future”. Sixty students showcased their talent. Working and still models on radioactivity, reflecting its origin, theory, properties, applications and adverse effects were displayed. A model on “hydroelectric power plant” highlighted the generation of power and electricity through the most renewable source of energy. Models on stoichiometric defects, solar cooker, carbon family and depletion of ozone layer were also put on display. Models on carbon family, radioactivity, crystal field splitting and hydroelectric dam won the first, second and third prizes, respectively. A two-day workshop on “Entrepreneurship, Creativity and Innovations” began at SCD Government College. The workshop was organised by the department of business innovations for MCom students. On the first day, Dr Ashwini Bhalla highlighted the need of innovations and creativity in business. Students were shown a recorded lecture of Nandan Nelkani, chairman, Unique Identification Authority of India. In the second session, Dr Harblas Heera presented his views on “Innovations in today’s life”. Presentations by students on various issues were given. Principal Jasbir Kaur Makkar congratulated the department of business innovations on organising a series of workshops for the benefit of students. A dengue awareness rally was organised by GMT College of Education. Students and teachers of the college took out the rally. They were carrying placards. GN International Public School, Model Town, celebrated Gurpurb. Students presented shabads and recited poems. “Guru Taar Taaran Harya” shabad sung by Prabhjot left the 'sangat' in ‘pandal’ spell-bound. The ‘pandal’ was decorated with flowers. Jagraon: Khalsa College for Women (KCW), Sidhwan Khurd, organised a function “My Mother in My College” on Saturday. The event was organised by the department of political science and sociology of the college with the motive of enhancing the knowledge and confidence of women. An extension lecture on “The Challenges of Being a Woman Today” was delivered by Prof Rajesh Gill, chairperson, department of sociology and centre for women studies, Punjab University, Chandigarh. Principal Dr Paramjit Kaur proposed the vote of thanks. Sahir Ludhianvi was of convivial nature, the one who was sociable and friendly. He received his early education at Malwa Khalsa High School and later joined Government College, Ludhiana. During these years, he came into contact with a number of persons with whom he struck lasting friendship. Ibne Insha and Hamid Akhtar were Sahir’s contemporaries who earned, with the passage of time, prominence like him in the field of Urdu literature. Both of them shifted to Lahore after the Partition, leaving a big void in the literary ambience of the city. In the later years, Ajaib Chitarkar and Krishan Adeeb, who had been under his influence since the publication of Talkhian, formed lasting friendship with him. In the meanwhile, Sahir had shifted first to Delhi and then to Bombay to try his luck in Bollywood. Earlier, Painter Pritam Bawri, whose studio was near the Clock Tower, had provided company to the poet when he was passing through straitened circumstances. It is said that Bawri was the first person to whom the poet had recited his poem Taj Mahal which later earned great acclaim. Now Ajaib Chitarkar, poet and artist, is the only person in the city was very close to Sahir in yesteryears. He remembers the memorable day of 23rd November, 1970, when the poet visited Ludhiana to recite his poems on the occasion of Golden Jubilee celebrations of his alma mater. Sahir at one time visited Punjab Agricultural University when he as well as Krishan Adeeb had been employed there. Both of them went to Bombay at the invitation of Sahir and stayed in his bungalow Parchhaian for some days. All these events have been recorded by Krishan Adeeb in his book on Sahir-Khabon ka Shehzada. This book was rendered into Punjabi from the original Urdu by Ajaib Chitarkar. Ajaib Chitarkar is suffering these days from ailments generally associated with old age. He is a revered figure in the literary circles. He served Punjabi Ghazal Manch for a long time as its president. On Sunday, November 13 an award will be given in his name, while another one will be given at Punjabi Bhawan in the name of Dr Randhir Singh Chand, founder of the manch. On this occasion, I am reminded of Chitarkar’s poem Saraap (A curse) wherein he recalls the days of his childhood, youth and later years in a captivating manner. Learnt to take first steps. For ushering in the stream of milk. Many times on these structures. Taking prompt action following a pipe-bomb blast on October 28 at Madurai in Tamil Nadu to foil the Rath Yatra of BJP supremo LK Advani and threats issued by the All-India Sikh Students Federation (AISSF) to disrupt the rally, the city police tightened security on the route from where the “Rath Yatra” was scheduled to proceed and impounded a large number of vehicles parked haphazardly on the road. The police also impounded the scooter of a resident of Haibowal for breaching security. She had come to purchase medicines in the old city area hours before the “Rath yatra” was scheduled to arrive. The women identified as Yogita (28), who was accompanied by her child, parked her scooter near BL Kapur Memorial Hospital and went to purchase medicines. When she returned, she was shocked to see her scooter being towed. “I asked the cops reason behind towing of my scooter. The cop told me that I have breached security by parking the scooter in a prohibited area. They told me that the place has been cordoned off due to Advani’s visit,” Yogita added. Police sources said the action was taken following intelligence inputs that anti-social elements were trying to disrupt the rally. Hence the area was sealed and strict orders were issued to impound abandoned vehicles. The woman’s scooter was released in the evening. The Inqulabi Kendra Punjab will organise a play on Irom Sharmila Chanu, known as ‘Iron Lady of Manipur’, at towns in Punjab in the last week of November. Kanwaljit Khanna, general secretary of the ‘kendra’, gave this information during a press conference here today. Health and Family Welfare Minister Satpal Gosain has said the campaign to curb the menace of drug addiction will continue. He stated this while distributing appointment letters to 20 persons who got jobs in the health department on compassionate grounds at the Circuit House here. He served a warning against adulteration in eatables and asked those present to act against drug addiction and adulteration. The Punjabi Ghazal Manch, Punjab, organised its 20th annual function at Punjabi Bhawan. Prof Niranjan Tasneem was honoured with “Shri Ajaib Chittarkaar Award for 2010” and Hardial Saggar was honoured with “Dr Randhir Singh Chand Memorial Award for 2010”. A ghazal darbar was held where Amarjit Singh Sandhu, DR Dhawan, Prem Avtar Raina, Rajinder Pradesi and Ajit Pyasa recited ghazals and poems. Former Vice-Chancellor of Guru Nanak Dev University Dr SP Singh, president, Punjabi Sahit Academy, Prof Gurbhajan Gill, president of the sabha, and Urdu poet Sardar Panchhi and dramatist Dr Atamjit Singh were among those present on the occasion. They work day in and day out, just like grown-ups. Their childhood has been impinged upon by responsibilities and innocent smiles stolen by the work they do for a living. While children across the city celebrate Children’s Day, the day has little meaning for these children, for whom every day is a workday. They shoulder responsibilities early in life, some being blissfully ignorant as they volunteer to work and others pushed by their circumstances. Eleven-year-old Raju works at a garments shop in AC Market. He used to go to school, but did not like it. Ask him about Children’s Day and he shakes his head, indicating his ignorance. Abdul Talib is 12 years old. His day, distributing tea, starts at 8 in the morning. He goes back home at 8 in the evening. “I wanted to study. As money became scarce at home, I had to give up studies and start working,” he said. Sarvan Kumar serves water to guests and does all the cleaning at a shop. He earns Rs 1,500 a month, but this is enough to support his family of six, including three siblings. He had to give up studies following financial constraints. Ask him about Children’s Day and a smile lightens up his face. “I know that it is ‘Bal Divas’. We used to celebrate it at school.” Sadness immediately follows as it will be a day at work, as usual, for him. The Khamano police has claimed to have arrested three youths with a revolver and two knives during a special ‘naka’ near Majri village the previous evening. Khamano DSP Balwinder Singh Randhawa said three youths on a motorcycle were stopped and they failed to give proper answers on being questioned. During their search, a .315-bore pistol with a live cartridge and two knives were recovered from their possession. They were identified as Jagdeep Singh of Monpur village, Gurwinder Singh of Khattra village and Jagroop Singh of Ismailpur village in the Khanna police district. A case under Sections 25, 54 and 59 of the Arms Act was registered against them at the Khamano police station. According to the DSP, Mandeep Singh Kala of Majri village had been teasing the sister of Jagdeep Singh. When Jagdeep objected to it, he was beaten up by Mandeep. Jagdeep’s friend Jagroop Singh was also assaulted by Mandeep and his associates. To take revenge, Jagdeep bought a pistol from Uttar Pradesh. Jagdeep and his friends were arrested before they could to teach Mandeep a lesson. The police was on the lookout for Mandeep, who had been booked in a case earlier. The three-day 14th Punjab State Special Olympics concluded at Guru Nanak Public School, Sarabha Nagar, here today. Parents of these “special” players who finished among position holders were joyous as their wards exhibited competitive qualities during the games and won laurels for their respective schools and NGOs. Final day’s results: 50m (Wheel-chair race): Harshveer (Ashirwad) 1st and Vishesh Gupta (Ashirwad) 2nd. Running long jump (8 to 11 years male): Kamal Khanna (Asha Kiran, Hoshiarpur) 1st and Tejinder (Nirdosh, Ludhiana) 2nd. Running long jump (above 22 years male): Arjun (Vista Red Cross, Moga) 1st, Mangat (Vista Red Cross, Moga) 2nd and Anil (Vista Red Cross, Moga) 3rd. Running long jump (16 to 21 years male): Ravi Kumar (Mini Bright, Pathankot) 1st, Gagan Brar (BE Asha, Patiala) 2nd and Vicky (Asha Kiran, Hoshiarpur) 3rd. Running long jump female: Ranjeet Kaur (SSA, Amritsar) 1st. Running long jump male: Vishal (DSOA, Muktsar) 1st, Deaut (DSOA, Muktsar) 2nd and Chandan (DSOA, Muktsar) 3rd. 100-m walk lower ability male: Shamsher Singh (AMK, Ropar) 1st, Gurmehar Singh (Umang, Faridkot) 2nd and Baljeet Singh (AMK, Ropar) 3rd.100-m walk lower ability female: Reepita (Francis, Pathankot) 1st, Rekha (Nirdosh, Ludhiana) 2nd and Rimpy (Nirdosh, Ludhiana) 3rd. 50-m walk lower ability male: Vikas Rai (AMK, Ropar) 1st, Gurmehar Singh (Umang, Faridkot) 2nd and Ramesh Singh (Asha AWWA, Pathankot) 3rd. 50-m walk lower ability female: Babu (BPS, Amritsar) 1st, Yashodha (BPS, Amritsar) 2nd and Suman (BPS, Amritsar) 3rd. 400-m walk mix group: Manjinder Singh (Jivan Jyoti, Nabha) 1st and Maninder Singh (B.E, Asha, Patiala) 2nd. 200-m Dash (male 8 to 11 years): Ritika (Saint Francis, Pathankot) 1st, Joshi Sharma (Jivan Jyoti, Nabha) 2nd and Kamaldeep Singh (Jivan Jyoti, Nabha) 3rd. 200-m Dash (12 to 15 years male): Sukhjinder Singh (Sehyog, Sangrur) 1st, Sourav Sangra (Asha AWWA, Pathankot) and Rohitash (Vdaan, Jalandhar) 3rd. 200-m Dash mix group: Mandeep Kaur (Asha AWWA, Pathankot) 1st, Ruley (DSOA, Jalandhar) 2nd and Rosy (St. Francis, Pathankot) 3rd. 200-m Dash (16 to 21 years male): Suraj (BPS, Amritsar) 1st, Raju (BPS, Amritsar) 2nd, Gursimran Singh (BPS, Amritsar) 3rd. Standing long jump (lower ablity male): Gaurav (Muskan, Ludhiana) 1st, Tejinder (Nirdosh, Ludhiana) 2nd and Nikhil (Asha AWWA, Pathankot) 3rd. Standing long jump (lower ability female): Anjali (Muskan, Ludhiana) 1st, Lovely (Saint Francis, Pathankot) 2nd and Jewan Lata (Mini Bright, Pathankot) 3rd. The Ludhiana Bodybuilding and Fitness Association will organise Mr Ludhiana Championship in the junior and senior categories at Luxmi Narayan Mandir Complex, adjoining DAV Public School, Bhai Randhir Singh Nagar, on December 4. The competitions in the junior section will be conducted in the below-55-kg, below-60-kg, below-65-kg, below-70-kg and above-70-kg weight categories. Participants should be under 21 years of age to take part in this category. They should bring their original date-of-birth certificates with them. The competitions in the senior section will be held in the below-55-kg, below-60-kg, below-65-kg, below-70-kg, below-80-kg and above-80-kg weight categories. The district bodylifting competition, with chin-ups and parallel-bar dips, will be held in the below-55-kg, below-60-kg, below-65-kg, below-70-kg and above-70-kg weight groups. Registration can be made between 10 am and 12 noon on the same day at the venue, according to the honorary secretary of the association, Ravi Prashar. Mata Sahib Kaur Hockey Academy being run at Jarkhar village near here on the Malerkotla-Ludhiana road hogged limelight as its trainees booked a berth in the last four stage of the All-India Nehru Hockey Tournament (U-17) currently being played in New Delhi. The upcoming players of this academy have taken part in the national-level tournaments and performed consistently. Jarkhar lads scripted a hard fought 4-3 victory over Baba Uttam Singh Academy, Khadoor Sahib, to open their account. In their second encounter, Jarkhar players drew 3-3 with Maharaja Ranjit Singh Academy, Amritsar, to book a place in the semifinals.